Bonnie is created by game freak & Nintendo. 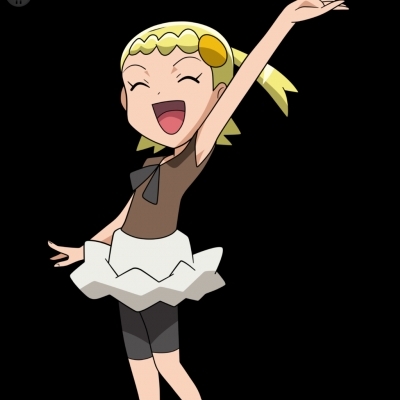 She was in Pokemon X and Pokemon Y, as Clemont's (the electric type gym leader of Lumiose City) younger sister. She gave out quizzes to trainers who came to challenge the gym, who if they get it wrong would have to challenge a trainer. Bonnie also appeared in the Pokemon anime in seasons 17-19. She wasn't old enough to have a Pokemon, as she was younger than 10 years old, but she took care of Clemont's Dedenne (which was promised that it would be hers once she's old enough), & later on she took care of squishy (a nickname given to one of Zygarde cell that the group found). She along with her older brother Clemont, joined ash's journey and were the first ones to do so on ash's Kalos quest. Bonnie usually tried to get her brother to marry some chick she finds suitable, but is usually pulled away by her brother. In the end, squishy left her, as he had to clean up after team flare. And her and Clemont left at the end of season 19, as Clemont had to help train a new Clembot, a robot that resembles Clemont designed to take over being the gym leader so Clemont can do other things. (the old one choose to get destroyed to save Kalos, wrecking its memory).